Chronicles of Nushy: [Rant] Is Asus Transformer Book T100 a decent replacement for the Dell Latitude 10 Essentials? [Rant] Is Asus Transformer Book T100 a decent replacement for the Dell Latitude 10 Essentials? Indeed it is, if I was living in the US. In the US, the price of the 32GB model is $349 and 64GB model is $399. If I can make at least $200 from my old tablet, I say that's good enough. I don't want to get the 32GB model though. That would be a downgrade from what I have right now. The Asus Transformer T100 is ones of the first BayTrail tablets that came out with the launch of Windows 8.1. That $349 price tag includes a hardware keyboard as well. (AFAIK, it lack the addition battery though). Doesn't matter. Even with the Latitude 10, I'm not having problems with the battery life. I am fine having to charge it every night if required. Other than that, the price is the selling point. This price is same as Surface 2 which is ARM based and doesn't come with a keyboard. (You have to pay an additional $120-130 for a hardware keyboard on it.) 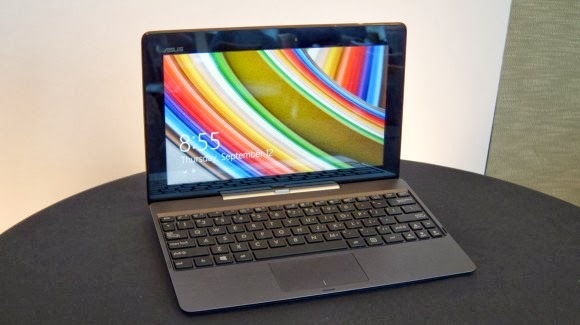 And this is a convertible tablet, not just a tablet with plugable keyboard. The Surface 2 is not a proper laptop, because it doesn't stay stably on the lap. Besides, there aren't any other options. Dell has Venue 11 Pro and that's about it. But it is not available for purchase as of today. If you compare the Asus T100 with the Dell Latitude 10 Essentials, the differences are very noticeable. First, it has a CPU that's more than twice as fast as the one in the Dell. Then the GPU is many times faster. You get the keyboard. You get free Microsoft Office 2013. although it doesn't come preinstalled - a key to install the software is bundled with the package. Nevertheless, you get the best office suite for free. The speakers are very loud - as per reviews. The speakers on the Dell are horrible. It's about 100g lighter as well. The storage is still eMMC, but it would be slightly faster than the one on the Dell. Not sure if the performance difference would be noticeable though. I have always felt that the sluggishness of the Dell was always due to the sluggishness of the storage subsystem, not the CPU. So if that is the case, even a small bump in storage performance would be a godsend. Plus, it comes with Windows 8.1 out of the box. So you don't have to update to Windows 8.1 if you had to do a factory restore. Only thing you are going to miss is the back facing camera. Who takes photos with a tablet anyways. Ah, and you don't get a full sized USB port on the tablet although one is available on the keyboard so that is not a big deal. I wonder if you can use both of them - the one on the keyboard and the one on the tablet body - at the same time. That would be awesome. I really miss not having multiple USB ports on the Dell. So, obviously there is no competition between the Dell and the Asus. The Asus wins hands down. There is one issue though. I don't live in the US. I live in Japan, and in Japan this tablet costs $449 for the 32GB model and $549 for the 64GB model! Ouch!!! That's too much! They want me to pay an extra $150 for the same 64GB tablet? Sofmap is giving 10% points if we buy it from them, so the price of the tablet drops below $500. But still, I'm not sure that is worth it. I'll wait and see if the prices would drop. Perhaps when more and more shops start selling the tablet, it would become cheaper. On the other hand, the Surface Pro 2 128GB is going for $870 for some reason. The price in the US is $999. Weird country Japan is!